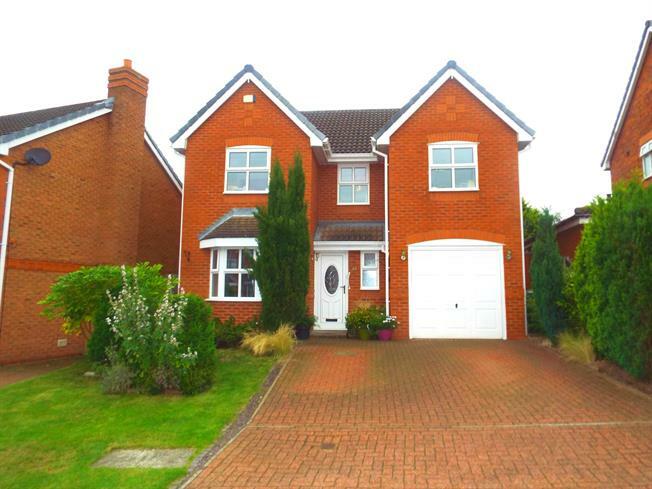 4 Bedroom Detached House For Sale in Warrington for Offers Over £290,000. This modern detached property is located on a cul-de-sac within the popular residential area of Whittle Hall and has a spacious and well planned layout with two separate receptions room, four double bedrooms, family bathroom and a recently updated impressive en-suite shower room. The property also has driveway parking, integral garage and mature landscaped gardens. The property is ideally placed for accessing well regarded schools, shops and travel networks. UPVC double glazed front door opening onto the driveway, radiator, coving and down lights. Double glazed uPVC window with obscure glass facing the front, radiator, tiled splash backs, ceiling light, low level WC and pedestal sink. UPVC double glazed French doors opening onto the patio, double glazed uPVC window facing the rear overlooking the garden, radiator, gas fire, coving and ceiling light. UPVC double glazed bay window facing the front, radiator, coving and ceiling light. UPVC double glazed window facing the rear overlooking the garden, radiator, down lights, roll edge work surfaces, fitted wall and base units, circular sink with mixer tap and separate circular drainer, space for freestanding range oven, overhead extractor, space for standard dishwasher and fridge/freezer. UPVC double glazed door to the side opening onto the patio, radiator, down lights, roll edge work surfaces, fitted wall and base units and space for washing machine. With uPVC double glazed window facing the front, radiator and ceiling light. Double glazed uPVC window facing the rear overlooking the garden, radiator, fitted wardrobes and ceiling light. Double glazed uPVC window with obscure glass facing the side, heated towel rail, part tiled walls, ceiling light, low level WC, walk in enclosure shower and pedestal sink. Double glazed uPVC window facing the front, radiator and ceiling light. Double glazed uPVC window with obscure glass facing the side, radiator, part tiled walls, ceiling light, low level WC, panelled bath and pedestal sink. With power and ceiling light.